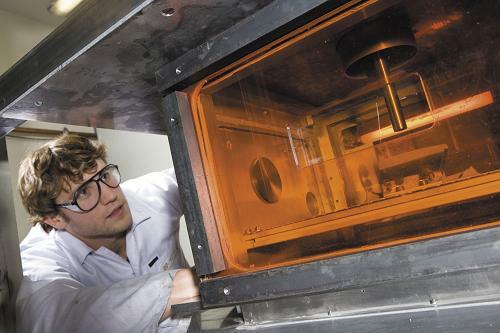 Cold gas dynamic manufacturing (CGDM) is a new production process that enables novel combinations of materials and metals in a single 3D component. 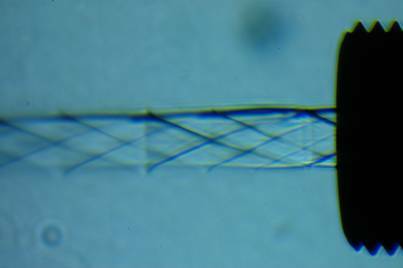 Using this technique, materials with previously unimaginable characteristics can be produced with relative ease. Cold gas dynamic spraying uses high-pressure, high-flow rate helium gas, heated to relatively low temperatures (150°-300°C). By using a supersonic converging/diverging nozzle, powder entrained in the high speed gas jet is accelerated to velocities in excess of 500-1000m/s. 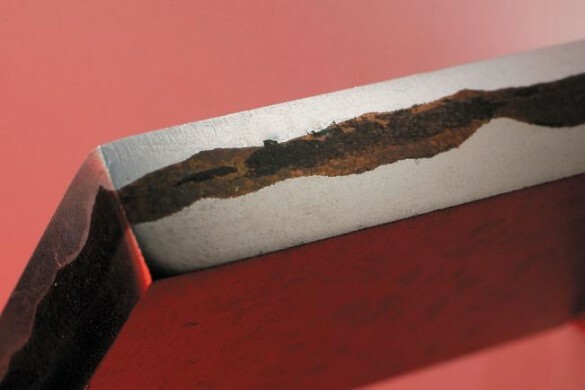 As the particles hit the target surface they impact under large plastic deformations, consolidating to produce localised forge bonding, depositing coatings at up to 100 g/min. A bespoke manufacturing system has been designed for the cold spray process. 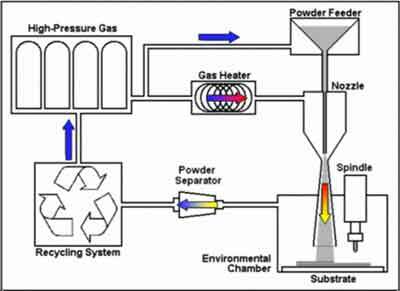 The gas delivery system incorporates a world first flexible helium recycling plant developed by BOC gases. The design of particle acceleration nozzles is fundamental to the process and fluid dynamic simulations are used to optimise nozzle designs. 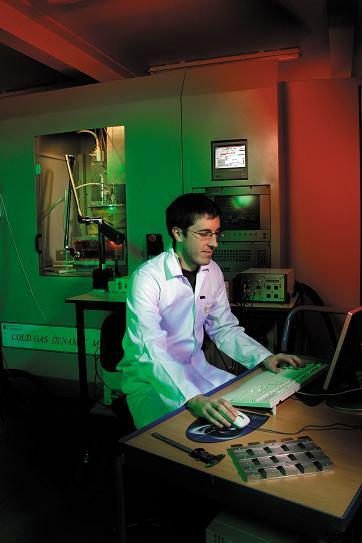 The CGDM system developed at the University of Cambridge is designed specifically for additive fabrication. While exploiting Cold Spray's high build rates, in-process machining was combined with novel build strategies to increase shaping fidelity. Moreover, helium was used as process gas to improve deposition performance and material functionality. To ensure economic viability, helium recycling was employed. One of main areas of research in the CGDM project was nozzle design and bow shock phenomena; and in particular, how they affect deposition performance. In terms of nozzle design, Computational Fluid Dymanics (CFD) has been used extensively to help construct nozzles of different profile and length, specifically for the process. 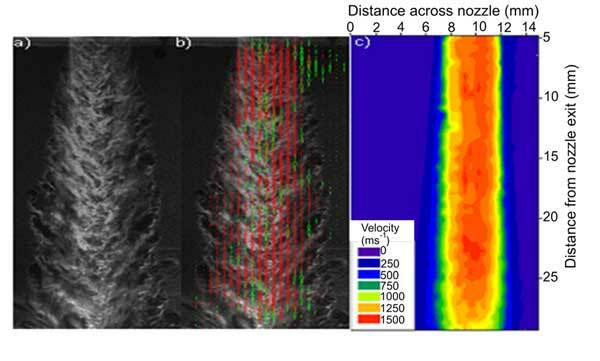 In order to assess their gas-dynamic performance, as well as to validate the CFD, Schlieren imaging and Particle Image Velocimetry (PIV) have been used to investigate gas flow and particle velocities respectively. We have successfully deposited aluminium, copper and titanium metal onto a variety of substrates of metal, ceramic, glass and plastic (including carbon reinforced composites). The deposits range in thickness from microns to several tens of millimeters. Tri-material sandwich built up from aluminium, copper and titanium. A useful measure of deposition performance is deposition efficiency (DE), which is the ratio between the amount of powder deposited and the total amount of powder sprayed. 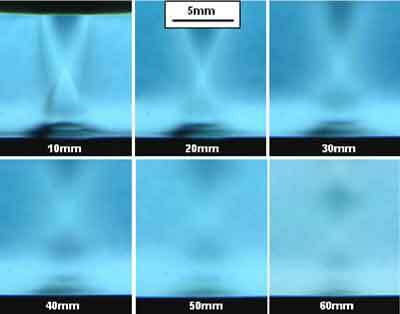 It has been shown that both nozzle length and nozzle profile have significant impact on particle velocity and hence deposition performance. DEs in excess of 95% have been achieved when spraying aluminium, copper and titanium. The short SoD region where the presence of the bow shock adversely affects deposition performance via a reduction in particle velocity. Here the DE rises rapidly until the influence of the bow shock becomes negligible. The medium SoD region where particle velocity and DE may continue to increase if the gas velocity remains above the particle velocity and the DE is not already at 100%. Otherwise the DE begins to level off. The high SoD region where the gas velocity has fallen below the particle velocity. If the particle velocity is at or close to the critical velocity then DE will begin to decrease. J. Pattison, S. Celotto, R. Morgan, M. Bray and W. O'Neill, Cold gas dynamic manufacturing: A non-thermal approach to freeform fabrication, International Journal of Machine Tools & Manufacture, 2007.47(3-4): p. 627-634. J. Pattison, S. Celotto, R. Morgan and W. O'Neill,Cold spray nozzle design and performance evaluation using particle image velocimetry, International Thermal Spray Conference, Basel, Switzerland (2005). R. Morgan, C. Sutcliffe, J. Pattison, M. Murphy, P. Fox and W. O'Neill,Analysis of cold gas dynamically sprayed aluminium deposits, Materials Letters, 58, pp1317-1320 (2004).